I have Visual Studio 2017 and command for run Xamarin.Inspector is not available. @yauheni_pakala The live inspector is available for VS Enterprise users. 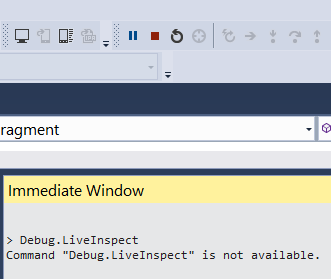 Where are you typing Debug.LiveInspect? I'm not familiar with this method of executing Visual Studio commands. Oh, I see, you have to prefix with > yourself. Very cool! In my testing, this does work. However, the fact that the Inspect button is disabled in your screenshot means that something is wrong anyway. The requested information should help. Can you also tell me what version of Workbooks & Inspector you have installed (according to Add/Remove Programs)? Thanks! And what kind of project are you running? I tried projects Android and iOS, both don't work. Strange, all of the log output in the bug you filed looked as if things are working correctly. Also, can you share the csproj files you were running? If they are private you can attach them as private in bugzilla and only Xamarin team members will have access.